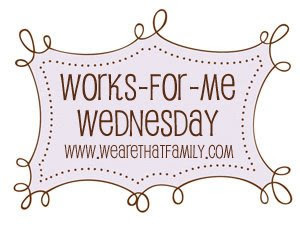 Works For Me Wednesday is a themed version this week and the theme is Back-to-School. 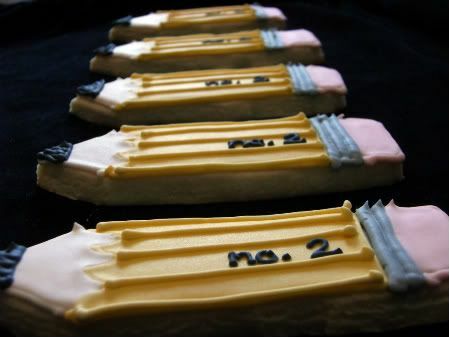 You may remember I made these number 2 pencil cookies at the end of the school year in May. Well, they'll work for back-to-school as well. :) Imagine bringing a box of cookies to your new teacher (hello, brownie points!) or the look on your little one's face when he pulls one of these babies out of his lunchbox. Thin the yellow and beige icings (reserving some yellow) with water to make the flood icing the consistency of syrup. Cover with a damp dishtowel and let sit several minutes. Run a silicone spatula through the icing to pop any large air bubbles and transfer to squeeze bottles. Thin the pink icing with water to make the consistency of syrup. Run a silicone spatula through the icing to pop any large air bubbles and transfer to squeeze bottle. 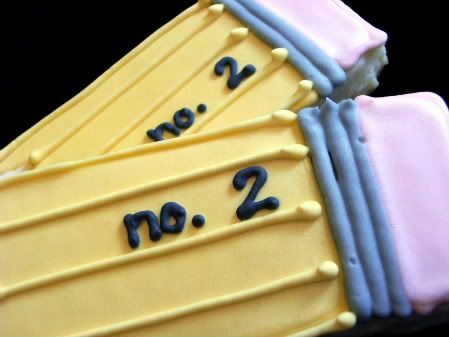 With a #2 tip, add the pencil detail stripes in yellow. Looking for more WFMW posts? Check out all of the back-to-school ideas at We Are THAT Family. And, you can click below for a few past entries from me. How creative was that! 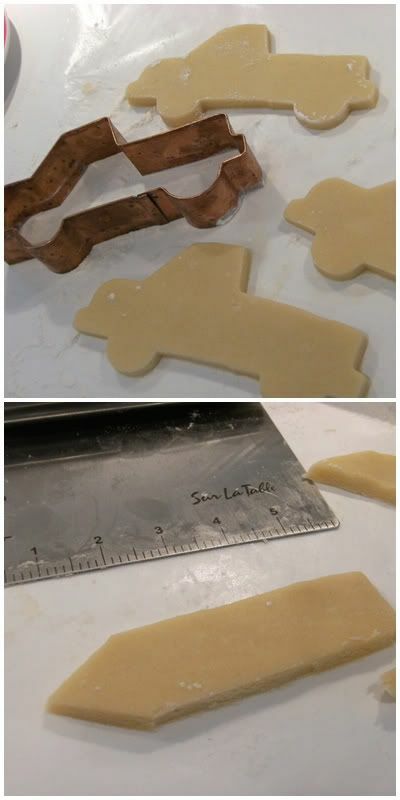 I would have never looked at a truck cookie cutter and turned it into a pencil. Great work! WOW. I'm impressed!!! These are gorgeous. Oh how cute! I love decorating cakes and cookies. This looks like a good project for me. Thanks! What cute cookies! They are beautiful! Love it!! They are incredibly cute! 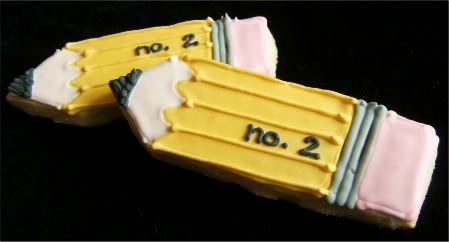 The cookies are really cute--they ALMOST make me ready for school to start. I love seeing how creative your cookies are. These are adorable! Love that last photo! The collage is VERY cool! You are so creative! 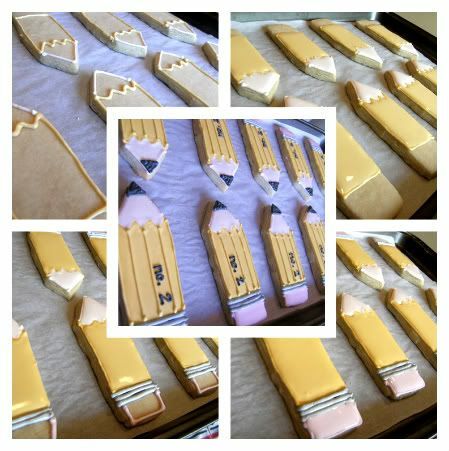 I love these...my sister is a teacher and I would love to make these for her first day! Adorable! We are SO making these for the first day of school. Really cute! What a cute idea! I'm definitely going to make some of these for my kids! Thanks for sharing! Just found your Blog this morning, and cannot be happier about it! Cookies with the "write" stuff; love it!! Not only is your title adorable, the cookies are too. The teachers and students will no doubt be gushing over these... It would make my day that's for sure! Thanks for the clever ideas! Seriously. Adorable! I will have to make those for my daughters, they would love them! I'm designing two back to school collections next week. I hope they look as good as your adorable pencils!! These are so cute! I am sure they can incite kids to go back to school! My husband is a school teacher and is after me to make him something to take his kids when he goes back to school! He would be so excited if I made these! So cute! super, duper, back-to-school cute! I am thinking of doing a "back to school treats" post featuring some of my favorite foodies, can I add these? Wow, these look amazing! Are you familiar with Drop In & Decorate? You'd be a star! Mandy...of COURSE!!! :) Thank you!